Compact and highly protective, the Pearl Izumi Men's P.R.O. Barrier Lite Vest is an essential take-along for variable-conditions riding. Barrier Lite ripstop fabric blocks out wind and rain with a DWR coating, and Softshell Lite panels keep the vest close-fitting so it's not flapping in the wind while you ride. Form-fit with elastic hem and cuffs. Features reflective accents for increased low-light visibility. I was hoping it was a little more lightweight, to be used as a vest on cool starts that I can easily stow away once it warms up. It is probably a bit more robust than I initially thought, but I have found it great this autumn for rides where I put on the vest and never take it off. I'm a huge fan of vests, and this one is kind of in the Gabba territory in terms of weight and conditions, but it does pack down a touch better to be put in a jersey pocket if needed. Ultimately I probably did not need this vest, but at the price it was going for I could not refuse. I'm 6' and 165 lbs with a fairly small chest at 38 and the vest fits well over a LS jersey and baselayer. Snug, but not restrictive. This is a staple item for any rider. The full zip and lightweight windbreaker fabric allow for easy removal during a ride if temperatures climb. The high collar helps cut wind but folds nicely if you don't need it. Inside is mesh, outside is a non-transparent black windbreaker fabric. Elastic around the waist and arm holes. Once single pocket in the back. I got the blackgrey and I love the look. Essential for those early morning foggy rides. 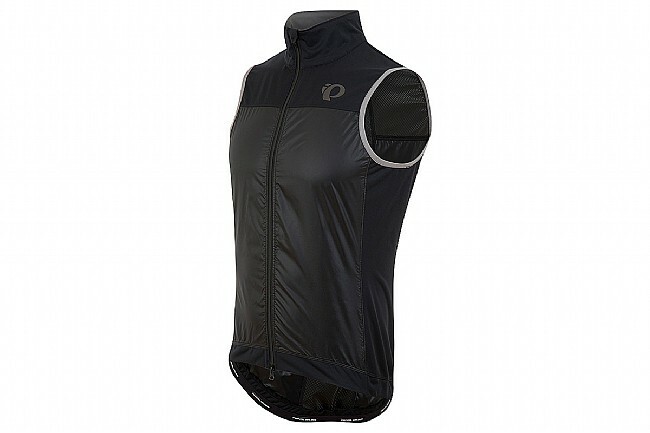 I love the vest, just that several Pearl Izumi items that I have purchased recently seem to have cheezy zippers. This one is no exception. Use it under my softshell in the cold weather, it works great and easy to pack if you need to dress down. This was a great purchase. Vest is form fitting, no flapping. Material is lightweight. Serves to keep the wind off and the heat in when you need that. Usable pocket in the back. The back is also solid, not mesh. At first I was skeptical but in practice it's actually better this way, especially in a light rain or mist. Only negative is the zipper is very thin and the pull tab is tiny. It's unobtrusive this way, but a bit clumsy zipping up and down on every climb and descent. Would buy again. Right vest for the right price. I searched for a vest that fit like this for awhile. Snug fit without being too tight and does not flap in the wind. Even though I have a 42 chest I went with the Medium. Glad I did. With the elastic panels on the sides it fits tighter than my previous Castelli yet seems to do a better job of protecting my previously fractured collar bone from the wind. I don't plan on testing it in the rain. It wads up into the size of half a banana has a back pocket which is not suitable for anything heavier than a route map. I would not expect, however, to be able to carry anything in a vest pocket made of a material this light.